certs, conventions, and even monster truck thrill shows. 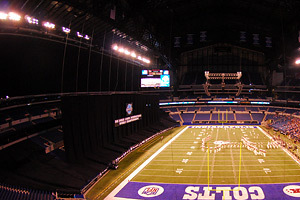 While some longtime drum corps fans have expressed concerns about the quality of the listening environment at the 2009 Drum Corps International World Championships within the confines of Indianapolis' Lucas Oil Stadium, recent history has shown the experience to offer a "sound" education for the Stadium Authority and others involved with addressing those concerns. 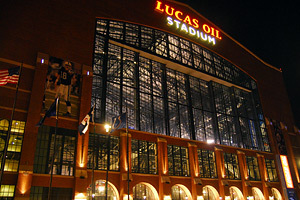 First, a back-story: As a musical venue, Lucas Oil Stadium opened not so much with a bang as a loud "clang" late in the summer of 2008. Country star Kenny Chesney christened the venue; but the highly-anticipated baptism instead left many in the crowd feeling like they were "drowning" in sound. Fast-forward to Chesney's second visit to the venue a year later. "The Indianapolis Star called Chesney's return concert a 'dynamite do-over,'" says Michael A. Fox, Stadium Director at LOS, who explains how lessons learned from the early performances led to action, including the permanent installation of new acoustical material in the performance area as well as an expanded system for hanging acoustical curtains throughout the venue. "This was on the list of [options] recommended by the sound consultants [WJHW-Dallas] to help the acoustics within the stadium," Fox notes. "The improvements were paid for by the Indiana Stadium and Convention Building Authority [ISCBA], which is the government authority responsible for financing, designing, constructing and owning Lucas Oil Stadium." Allan and Luke Bryan on Sept. 13, 2008. 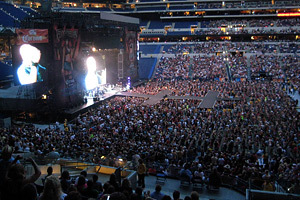 According to Fox, the lessons learned in the wake of Chesney's '08 concert offered a template for improving LOS as a showcase venue for Drum Corps International units. "This building has thousands of feet of drape that we can hang as needed, and it has real acoustical value," he says. "With the '09 Chesney concert, the stage was in the North end zone so the decision was made to hang drape behind the stage from roughly the 10-yard line all the way around behind the stage to the other 10-yard line–so it created an amphitheater effect." "The combination of various acoustical improvements and hanging the drape as well as Chesney's people adjusting their sound reinforcement, made the results of the 2009 show much better than 2008. It was a true group effort," he says. "I understand that concerts are a completely different animal [from drum corps]," Fox says. "But what we can take from the Chesney concert is obvious in the improvement in sound between the 2008 and 2009 events. It shows that if everybody gets together and agrees on parameters and works toward solutions, and with all the drape we have at our disposal, the sound can improve. There are many more options to hang drapes than were used in 2009 at the DCI World Championships." scape for the DCI performers and their discerning fans. Ultimately, Fox says the most important factor in the continued refinement of the acoustical environment is the way all parties work together to make adjustments for the good of the final product. "I think we can learn a lot from Chesney," he says. "They came to LOS in June and we spent some time on this thing. We tested a lot of ideas–and the result was an absolute home run. And just as we did with that show, when everyone gets around the table and is willing to spend some time to work together toward a common goal, then the acoustics for DCI and any other marching music event we do can most certainly be improved." Fox, his staff of event industry professionals, and a number of additional consultants have been involved in ongoing meetings and discussions with DCI Executive Director Dan Acheson, along with consultants and representatives from Drum Corps International who have been examining the stadium sound issues from many perspectives. "We know that the corps and everyone who supports them are very passionate about the quality of every aspect of the World Championships experience, and so are we," said Acheson. "Improving the quality of the sound within the stadium is a critical issue and an urgent priority for us. We will continue to work together with Mike Fox and his team to address concerns and to ensure that we are creating an unparalleled performance venue for corps members, and an exceptional environment for those purchasing tickets to these events. "The continued development of our strategic partnership with the city of Indianapolis is of great importance to us on many levels. The ongoing mutual investment in this relationship underscores the tremendous commitment we've all made toward the creation of a World Championship environment and home for Drum Corps International which are without equal."